We are fast approaching one of the World's most anticipating sporting events; the 2010 FIFA World Cup in South Africa. For those of you soccer fans it has been a long awaited 4 years since the Italy clenched the title in Germany in 2006. For those of you non-soccer fans this is your chance to enjoy the game, even if you don't know the team, players, or rules. Given that most of my family and friends know very little about professional soccer and/or its key players I thought I would help you all out by featuring a player from a different team each day this week until the US kicks off against England on Saturday. 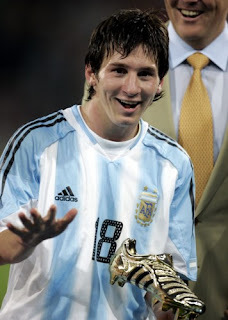 Today's player is Lionel Messi hailing from Argentina. This superstar makes his money playing for one of the most reputable and well-respected teams in the world, FC Barcelona. Only 22 years old he has taken the soccer world by storm winning the FIFA Player of the year. He is considered the best player of his time by his fans and one of the most destested by his foes. This striker is lightening fast, with a collection of one-on-one skills that can make any reputable defender lose his balance. Check out this video for a couple of Messi's best highlights. He'll be sure to stand out when Argentina plays Nigeria on Saturday, June 12 and chances have it that he will be a game-changer. * In the nine times the US and England have met, the US has won 2 games, scoring a total of 8 goals. England has one 7 of those games, scoring 35 total goals.